Remember that time you spelled “rhinoceros” wrong in the first grade? It was supposed to be your shining moment, a spelling bee stud kind-of-moment, yet you stood there with the blank stare, and showed everyone what you didn’t know. Imagine if everyday felt that way even though your spelling bee days were long past. 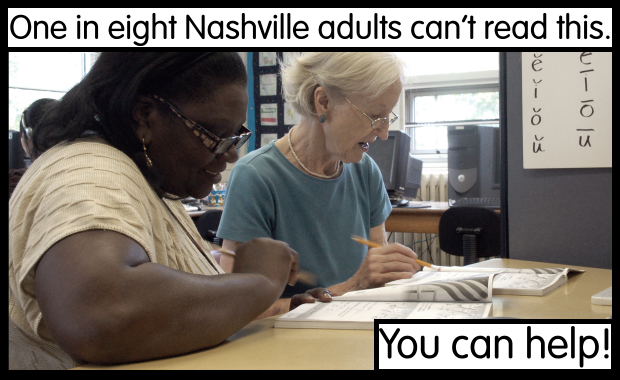 The truth is, over 1,500 Nashville adults struggle with literacy, yet most of us don’t know it. Thankfully, the Nashville Adult Literacy Council (NALC) has recognized the need for volunteer tutors to help teach reading to U.S.-born adults and guide adult immigrants in learning English skills. NALC serves over 1,500 adults annually, with the help of 500 volunteer tutors and 33 classes. 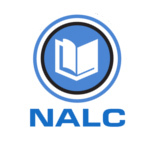 NALC’s vision is for all to learn and for all to help build a community of adults empowered through literacy. James Morehead, 2012 NALC Literacy Learner of the Year, comments, “When I was young, I always had a hard time reading and writing. I could not do things like make a grocery list. I had to draw pictures of the food when I went to the store. It was also hard to do things like fill out job applications to see if I could get a job. For a long time, I could not drive because I could not pass the driver’s test,” says James. James has the confidence he needs to flourish in the world today because of people like you who volunteer their time to teach him to read. The NALC would not exist if it weren’t for the people who share their knowledge, patience, and encouragement. Annually, over 500 volunteer tutors dedicate thousands of hours to teaching their fellow adults to read and write, and speak English. Volunteers from all backgrounds and occupations tutor with NALC. No teaching experience is necessary! If you can read, you can help. Aside from volunteering with the Start Now Program and One-on-One Tutoring Program, creative and devoted volunteers help NALC with events, office work, speaking engagements and community outreach, teaching classes, and facilitating extra-curricular activities for learners. The Nashville Adult Literacy Council holds volunteer trainings once or twice per month for both the Start Now and One-on-One Tutoring programs. Currently, there are 100 learners on NALC’s waiting list waiting for a one-on-one tutor. The One-on-One Tutoring Program is Nashville Adult Literacy Council’s primary mission. In this program, NALC matches one adult learner with one volunteer tutor based on schedule and location preference. Tutors are asked to commit to a minimum of six months with their learner, meeting between two and three hours per week. > Friday, January 11th, 9 a.m. – 1 p.m.
> Saturday, January 26th, 9 a.m. – 1 p.m.
Due to NALC’s growth and success, immediate accommodation for every learner is difficult. In fact, it can take six months or longer for a learner to be matched with a volunteer tutor. The Start Now Program allows learners to get immediate service while waiting to be matched with a long-term volunteer tutor. It also allows volunteer tutors greater scheduling flexibility than the One-on-One Tutoring Program. Tutors sign up for hour-long appointments as often or as little as their schedule permits, and meet with a new learner each visit. > Wednesday, January 30th, 6 p.m. – 8 p.m.
> Tuesday, February 26th, 6 p.m. – 8 p.m. Monthly training dates are always listed on NALC’s website. If you are interested in volunteering with the Nashville Adult Literacy Council, please email info@nashvilleliteracy.org or call 615-298-8060. For more information, visit the website at Nashvilleliteracy.org.